ASSURE is an instructional design model that has the goal of producing more effective teaching and learning. “ASSURE” is an acronym that stands for the various steps in the model. The following is a breakdown of each step. The first step in the process is that the teacher should analyze the attributes of her learners. There should be a focus on those learner characteristics which are associated with the learning outcomes desired. The information gathered will help you in the decisions that you make with respect to the other steps in the process. When you determine the character of the learners, it will guide you in choosing specific strategies and resources to aid the learning process. The general attributes of your learners, such as age, academic abilities, gender, interests, etc. 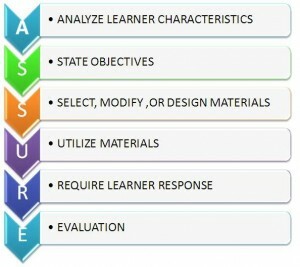 After the analysis of the learner attributes, the teacher must state standards and objectives for the learning module. This statement consists of a specification of what the learners will be able to do as a result of the instruction. To be more concrete about things, this statement will focus on what the learner will know or be able to do as a result of the instruction. An example of this is with medical students. The learners will be able to name at least two databases and two search techniques that they can use to locate medical evidence for particular cases. The objectives can be used in assessing the success of the students, perhaps for the grading process. Also, you can use them to let the learners know what they will accomplish through the class. Audience – For whom is the objective intended? Behavior – What is the behavior or performance to be demonstrated? Conditions – What are the conditions under which the behavior or performance will be observed? Degree – To what degree will the knowledge or skill be mastered? The objectives statement should be formulated with verbs that pinpoint the learning objective. A useful guide to the appropriate verbs to use is contained in Bloom’s Taxonomy. Remember that assessment can only be based on your learners’ behavior. A learner may know some material backwards and forwards but may not be able to perform well on a test. The second “s” in the acronym stands for select strategies, technology, media, and materials. Given what your learning objectives are, it’s necessary to pick instructional strategies, technology, and media that will bring about the results that you want. First, you should figure out what which delivery method will be best for your instruction. For instance, what proportion of your instruction will be instructor-centered and what proportion of will be student-centered? The first of these are strategies such as lecture, demonstration or showing a video. The second are strategies such as group discussion or cooperative group work. Common sense weighs in on the side of learner-centered strategies. Learning becomes more exciting when there is more class participation. Ultimately, it’s the learner who must gain mastery over the material, not the teacher. However, there will be a certain amount of crucial information and technique that the teacher must give over and demonstrate. Learning is at its best when the teacher merely leads the student into discovering the correct answer to a problem themselves. An effective teacher is merely a facilitator to the process of learning. Once you select your teaching strategy, then it’s time to figure out which technology, media, and materials best support the method of teaching that you’re using. This ranges from simple tools such as chalk and blackboard to more sophisticated ones such as power-point presentations. What must be remembered is that the instructor is the essential ingredient in giving over the material. Fancy tools are useful, but it ultimately boils down to having someone who knows more than what the textbook contains. This step in the ASSURE process concerns making a plan as to how you will utilize the technology, media, and materials that you have selected. As with all of the instructional steps, you must make sure that your plans contribute towards producing the objectives that you have laid down. This means that it’s important to plan ahead of time just how you’re going to use them. It’s good to do a dry run of your lesson before you actually teach it. Make sure that the whole lesson will go smoothly and seamlessly. You need to gather together all of the things that you will need to teach your lesson. They must be working properly. For example, if you are making a power-point presentation, then you’ll need to create the text and graphics for each screen. There is some minimal preparation required to set up the learning environment. Simple things like making sure that you have enough desks are important. Also, if you have control over the situation, you should make sure that there are no sources of noise that will disturb the students. First, you need to clearly inform the learners as to what the learning objectives are. This will help the learners create a mental map of what they need to absorb. Next, it’s important to tell the students how they will be assessed. You need to tell them what their assignments will be, how they will be graded, if there are tests, etc. Also, you should explain to the students what the benefits of learning the material are. You then actually carry out the lesson. This is where all of your planning takes effect. You should be prepared to carry out the lesson with every prior step of the process in mind. This will insure your success as a teacher. This step actually belongs within earlier steps. It requires that you make plans to how you are going to actively engage your students in the material that you are teaching. This needs to be figured out both at the class level and the individual level. The most basic step that you can take is requiring participation of the students in class discussions. A more sophisticated approach would require that students prepare questions and comments at home to bring into the class. You might try even allowing individual students to lead classes or discussions in the style of a seminar. Beyond this, you need to plan exactly how the students will participate in the learning process generally speaking. How will they learn the information and techniques included in a lesson? This plan needs to be more specific than just saying that they will listen and absorb the material. Maybe you will encourage a specific kind of note-taking or other learning strategies. Did your lesson meet the learning objectives that you planned? How will you determine whether the students reach the objectives? Is your way of assessing the students in line with your learning objectives? Can this lesson be improved? How? How are you going to assess the weaknesses in your presentation? Was your choice of media and materials a good one? How will you assess the effectiveness of these tools? Is it possible that other technologies, media, and materials would have done a better job? The final step in your evaluation should focus on feedback from your students. Was their experience positive overall? Do they feel that they have reached your objectives and their own personal objectives? How will you determine whether or not your performance was effective? In conclusion, the ASSURE process is really just a matter of common sense. However, it is good to follow a regimented guide to improve your teaching technique. Any effective teacher knows that the perfection of their technique does not come overnight, and there is always room for improvement. By following the ASSURE process, you will be sure to improve your teaching for many years to come.